Do You Want the Easy Life? Christchurch because you won't be gardening or spending hours doing housework. There is plenty of room for living in this approx. 99m2 unit, with the bedrooms downstairs the upstairs is for private living and enjoying the sunshine. Just close the front door, feel safe, and secure in your own environment. Singles, couples, young professionals, out-of-towners this unit is your answer to the "easy life" with quick access to the CBD, Victoria Street eateries, Merivale or Hagley Park walks and events. 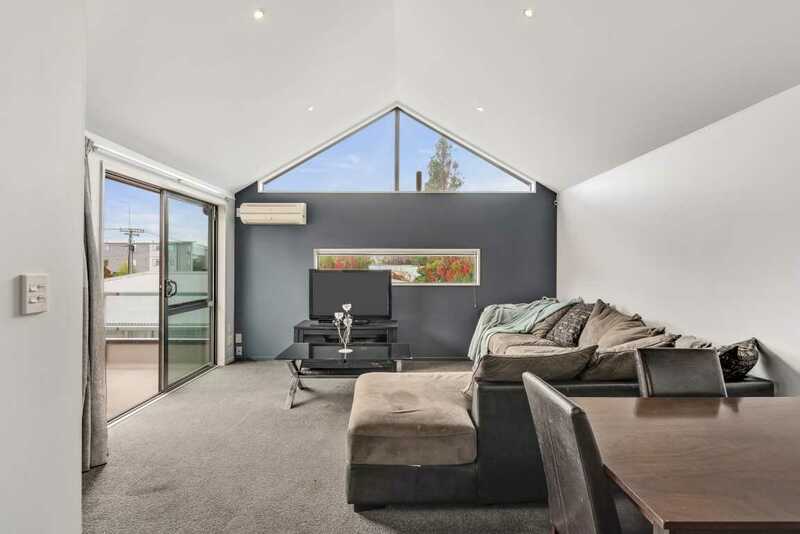 Fantastic contemporary living... view the stars at night from the high window, enjoy the airy and spacious feeling of the high ceiling - beautifully presented with new carpet and paint just 18 months ago. It contains two private outdoor areas, one at ground level being a small courtyard outside the bedroom and a lovely first level private deck from the living room creating great indoor/outdoor living. Whether buying for yourself or as an investor this is your chance to buy and "easy care" - with all the above advantages this would be a great home or renter! The owner having enjoyed this great location, cheap power bills and easy living has now moved to the country and there is no "plan b" - don't hesitate because this fabulous unit must be sold. Saturday 20 Apr 12:00 p.m. - 12:30 p.m.